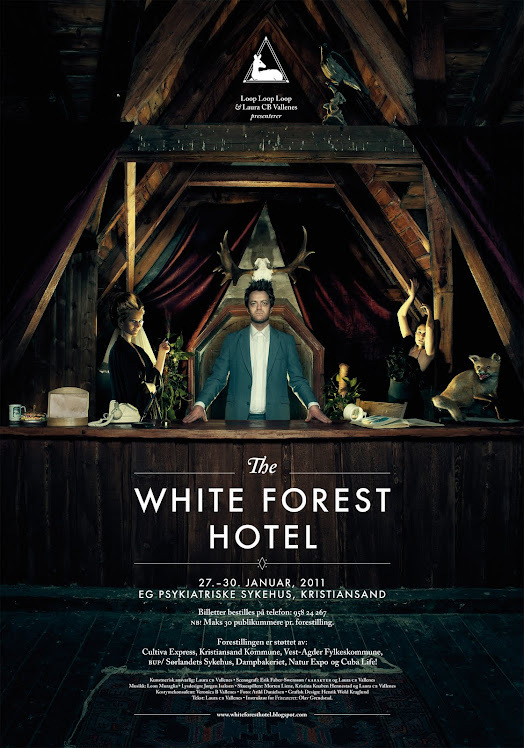 "The Whiteforest Hotel": "I mr. Ranger, or just Fred, if you like..."
..., was the first one who got to the accident. I throw myself down to the ground, like an animal in excitement of the scenery in front of me, I held my arms like if I had a gun. The forest was angry. Mean. I saw a letter. White shining paper lying in front of me. And then I saw her. (I had no gun, so my arms fell down, hitting my body, everything is so clear now..) the frosty moonlight fell on her white body. Her body. Her legs , her fingers, red lips… aaahh, she moved her lips, like she wanted to say: "I got to.. I....can´t. My sister.. "
I focused on the paper, a letter, my fingers white and cold. Carefully I put my hands in the white gloves, which I always have in my pocket near my heart, starting to read. I read it out load, I don’t know why, it was not easy to see the letters. My voice ran in front of me along the threes, car forgotten..
”During the night I sleep very slowly…you..
wake up. So warm. Sun. Guess someone will find..
From that moment. I cant explain.. I love her.